Construction at North Marion School District started almost immediately after students left for the summer, thanks to last November's voter-approved $42 million bond. The high school track will be the first completed bond project, with final striping added this past Monday on the new red rubber. "We wanted green because we're the Huskies but everything else around here is green and we wanted it to stand out," Superintendent Ginger Redlinger said. "So we did red and it looks really nice." The track needed to be redone, Redlinger said, because the underlay had collapsed in areas, causing the track to be uneven and even gather water. As a result of a required cement border to give the track a defined edge, the areas for other track and field activities — including the long jump pit and javelin and discus ranges — had to be relocated, and were also redone with the red rubber top. There will be an official ribbon cutting and ceremony preceding the high school football game at 7 p.m. Sept. 14. While the track will be the first completed bond project, it barely scratches the surface of what all is included in the $42 million package. The primary school front parking lot is the first of many parking lot reconfigurations, and is expected to be completed by October. To allow for the parking lot expansion the portable that formerly housed the safety, student services and health staff had to be moved (the staff has relocated to the intermediate school for the time being, eventually moving to the high school when its reconstruction is completed). Redlinger said the district is waiting to get permit approval before work on the parking lot can go out to bid. The next parking lot reconstruction is scheduled to be done next spring at the middle school, but the neighboring hazelnut orchard (on the east side) has been leveled in anticipation of that expansion (the only construction work on the middle school building itself will be a seismic upgrade to its gym and locker rooms starting next spring, thanks to a grant unrelated to the bond). Having acquired the Johnston and Wilson properties last year, both located on the east side of Grim Road in the same block as the school buildings, the district also plans to possibly place portable classrooms there during high school construction. The 15 acres could also see future development of athletic fields and parking lots, but those aren't included in the bond, Redlinger said. In the meantime, the district is looking for anyone interested in buying the Johnston house and moving it off site. The Johnston barn will be deconstructed and possibly repurposed in the construction design, or possibly with new signage the district hopes to erect on the corner of Donald and Grim roads, the northeast side of Grim and Boones Ferry roads, and the southeast corner of the campus by the high school fields. The bond allows for a new traffic flow for buses and private cars that has already been approved by Marion County, Redlinger said. "We want to reduce the flow of traffic on Grim Road," she explained. "So buses will have a separate entrance (at all the schools), so they won't mix with passenger cars." This will also mean a staff parking lot and bus turnaround on the north side of the primary school and an expanded parking lot at the high school. The roadway that runs behind the primary and intermediate schools will no longer be accessible to vehicles once construction is completed. "Free range kids and buses and teen drivers don't mix," Redlinger said. That space will get an expanded and improved play areas for the K-5 students. The bulk of the bond money is going toward improving the nearly-70-year-old high school, the district's oldest building. The design concept has shifted slightly in recent months to accommodate cost savings where possible. Perhaps the most notable piece of the high school reconstruction, which isn't due to begin until next summer, will be a two-story wing that will connect the buildings. The career technical education and art programs are currently housed in a separate building on the high school campus; this wing would connect it to the main building. Redlinger said the design serves the ideas of both safety and inclusivity. "First of all, everything should be like home; we want kids to be part of a safe and secure environment," Redlinger said. "Secondly, all programs are equally important, so that all kids feel connected to the school and are important to the school. We want to avoid accidental isolation of students from each other — or staff from each other." The enclosed breezeway that would connect the CTE program would also allow for an area to showcase the program's projects, displaying things those students have made. The wood and metal shops themselves will be renovated for a more open space connected by a classroom in the middle. To make the CTE building more career-centric, the business classes will likely relocate there. Science classrooms will be part of the new wing but close to the CTE entrance. "That way you can look out the window and if you're doing the vocational education you're not relegated to just that building," Redlinger said. The special education program, currently in the CTE building, will likely move to a different part of the school, near the music wing, which will only see minor renovations. The main gym and commons area, which are newer parts of the high school, will also be the same, but the library/media center will be moved to the second story of the new wing, overlooking the commons. That area will become an expanded public use space, much like John F. Kennedy High School's commons area that was part of its bond reconstruction in recent years. Redlinger said it's possible that school board meetings could move there. The school board currently meets in a middle school classroom. Below the media center will likely be the food science classes, keeping it close to the food services/cafeteria area. The new design of the high school will mean there will only be two entry points into the school: at the commons and at the office. This is only one example of the increased security measures being implemented district-wide thanks to the bond. Security cameras will go up throughout the campus, and all entrances will be secured, allowing visitors to be buzzed through by someone in the front office. The entryway vestibule of each building will be redesigned so outsiders are forced to go through the main office. "We need to keep kids safe," Redlinger said. "We don't want to make it easy for someone who doesn't belong here to gain access." Additionally, exit doors that aren't at the front entrance will have locks removed and will not allow anyone to enter from outside. "They can open from the inside but they can't get in," Redlinger said. "We're going from a multitude of ways to get in to two ways in and multiple ways out." 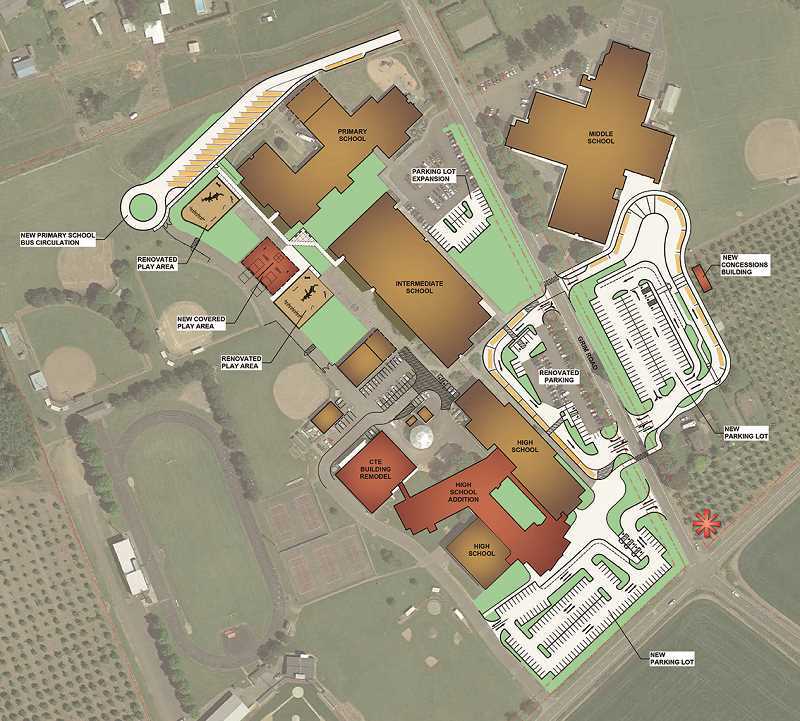 The high school design phase will continue through February 2019, and Redlinger said the hope is to get student, staff and parent feedback. There will be a survey passed out at back to school night later this month. "It will be about, 'How do you see yourself using this space,'" Redlinger said. "Included in that is asking how the bathrooms should be designed. Concerning civil rights issues, we want to make sure we have the right design elements so we meet everybody's needs." Overall, Redlinger said that the district has continued to take a conservative approach to the bond money so the budget is still met. "Existing problems (with other districts) are because it's already contracted work and tariffs increased prices," she said. "We aren't there yet, so we've made adjustments. Instead of steel (for the construction), we're using a wood base, that saves us about 25 percent. Wood materials are commonly used in this kind of construction and last just as long. So, we're doing things like that to keep costs down." For more information, including on construction timelines and design concepts, visit www.nmarion.k12.or.us and click on the "bond info" tab.